Kevin Garnett is in hot water after talking slam to Charlie Villanueva. IT’S A TWEET-eat-tweet world we live in, according to Dan Shaughnessy, the respected Boston Globe columnist this morning. The basketball world stateside is today scratching its head at another fine mess its players – and their big mouths – have landed it in. The always-quotable Kevin Garnett of the Celtics is alleged to have called Charlie Villanueva ‘a cancer patient’ during his side’s 109-86 victory over the Detroit Pistons on Tuesday night. A furious Villanueva tweeted the claim afterwards. Villanueva suffers from alopecia universalis, a medical condition that results in hair loss. Stay classy, KG. I would never be insensitive to the brave struggle that cancer patients endure. I have lost loved ones to this deadly disease and have a family member currently undergoing treatment. I would never say anything that distasteful. The game of life is far bigger than the game of basketball. Do I believe Garnett talked that stiffly in the heat of the game and said, “You are cancerous to your team and our league”? No, I don’t. Not at all. Maybe Villanueva didn’t hear KG precisely right, but I have a hard time believing KG said it that way. After getting called out, this was an easier way out for Garnett than simply saying, I’m sorry. Rest assured, there are plenty of people who have a bigger issue with Villanueva ratting Garnett out. And they’re entitled. That’s the code of the league, that’s the way it always goes. I actually heard what Kevin said. I was right there, what he really said is in the statement. I don’t like the whole tweeting thing. … Guys talk on the court. It doesn’t mean they should or shouldn’t. The fact that we’re talking about this, it’s just silly. It’s left to the merciless Boston press then – as is often the way in American sports – to come down hardest on their own. And Dan O’Shaughnessy does not spare the rod with his city’s biggest star and it’s side’s talisman. [It] is a rare window into what goes on between the lines, where the basic rule of engagement is that there are no rules of engagement. Nothing is off-limits. What has changed is that now we find out about vile garbage that dares not speak its name. We never would have known about it in the genteel good old days. Whichever version you believe, it’s tasteless. It’s offensive. It’s way beyond the typical schoolyard, “You’re fat, you’re ugly, your mother wears army boots.’’ There’s nothing funny about poking fun at cancer. It is a universal scourge. It is off-limits in every arena of mankind. Email “Say what? Did Kevin Garnett go too far with the trash talk this time?”. Feedback on “Say what? 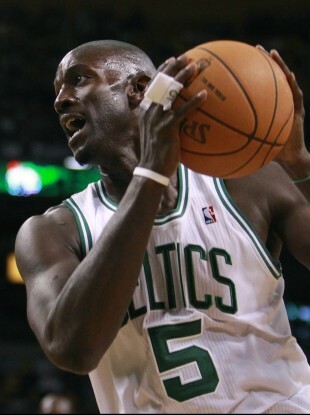 Did Kevin Garnett go too far with the trash talk this time?”.